Human beings are not built to last for ever. We are human, and with time everybody dies. The process usually starts with discernible minute degradation in bodily and organ functionality. You find out you can’t do stuff you were once capable of. It’s the same with the ears. As we age we start losing some hearing. It varies from one person to another. Some people might experience hearing loss at 50 while some people possess a crystal clear hearing at 80. It’s not a disease or something to be alarmed about. It’s just nature’s way of telling you you’re ageing, and that it’s time for you to get a hearing amplifier. A hearing amplifier simply amplifies sound, sort of, like a microphone. It picks up sound from the surrounding and amplifies it in your ear, making you hear sounds that were inaudible to you. Hearing amplifiers come in different shapes and sizes. There are lots of hearing amplifiers in the marketplace and choosing one out of the whole pack is not an easy decision. Christened the “all digital volume control personal sound amplifier”, this device is as best as they come. If you can look further than the price you’ll see that it is an ideal hearing amplifier. For one, the Otofonix hearing amplifier comes with four pre-set configurations. You can use it in a number of places and get the best results. 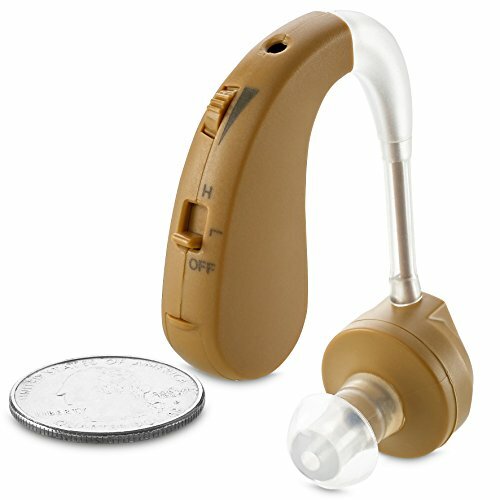 It has a ‘normal’ setting which is for regular listening, a ‘noisy’ setting which reduces background noises and is suited for restaurants and malls, a ‘treble’ setting which decreases annoying high pitched sounds like whistling and squealing and a ‘quiet’ setting which is the battery saving mode and is meant to be used in quiet environments. You can change these settings with a click. A short press changes the volume and a long press (3 seconds) changes the setting. The device is small enough to fit snugly behind your ear when in use. It won’t be noticeable unless someone moves closer and you can wear it all day long comfortably. There are buttons on the digital device which enables you to switch between 10 different volume levels. It boasts of an adaptive, layered noise reduction feature which reduces background noises and cancels acoustic feedbacks too. Normally, the digital device is adaptive and the more you use it, the better it gets. It boasts of an awesome sound production due to its 4 pre-set configurations. It works well in different environmental conditions with varying noise levels. It comes with different ear dome sizes. It is not recommended for individuals with profound or severe hearing loss or people suffering from tinnitus. 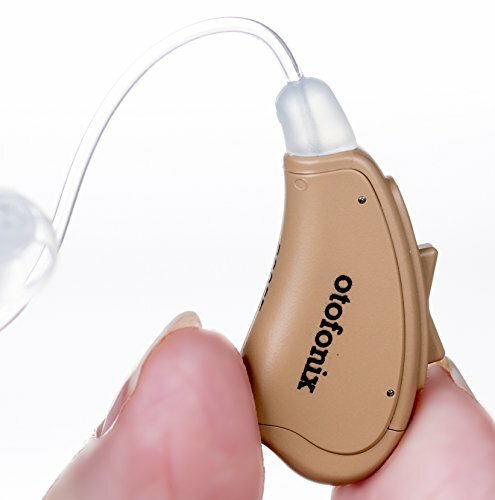 The Tweak Hearing Focus Amplifier is similar to the Otofonix Hearing Amplifier when you consider the price range, but they aren’t that similar in other aspects. This device is slightly larger than the former and the design is different too- it is longer and thinner. However, these features don’t make it inferior to the other nor impede its functionality. 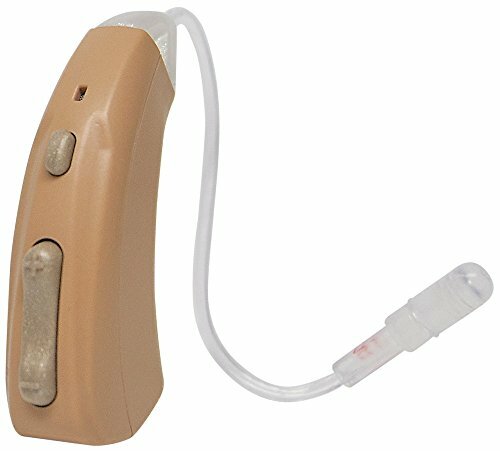 It is the first choice hearing amplifier among many seniors who aren’t bothered about size, and it’s not like it’s that large. The device comes with a digital volume control and lets you select from four ranges of amplification, and remembers which level you like best. This hearing amplifier boasts of a new patented technology used in high-end hearing instruments. Maybe this explains its relatively high price. New tech means you pay more money for it. Furthermore, it offers a range of acoustic algorithms from which you can choose your preference. It comes with two programs- one is suitable for use in quiet environments while the other is for suppressing background noise in noisy environments. It also sports two microphones and can be used in any type of social situation. It boasts of a very strong battery which lasts for 7 to 10 days with full time use. The batteries come cheap too. Switching between the two programmed modes- omni (quiet room) and directional (noisy room) is seamless. It is not programmable to custom frequency ranges. Instead, it is pre-programmed for the most common type of hearing loss- high frequency loss. Sometimes the device doesn’t work with some people, leading to loud noise levels and pains in the ear. 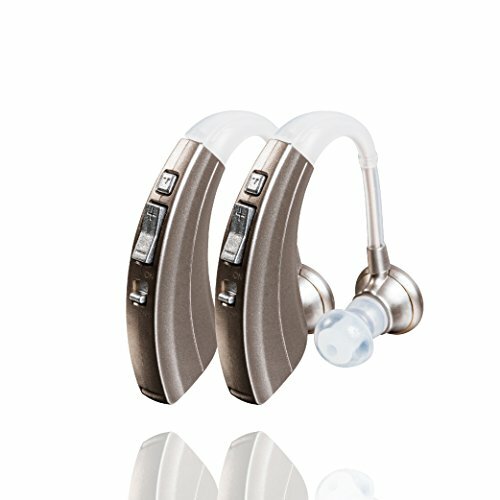 The Banglijian hearing amplifier is another top-quality hearing device that is approved by the FDA. It boasts of a design better than the two aforementioned devices preceding it. The aesthetics is pleasing to the eye. The device looks good and will fit snugly into the corner behind the ear easily. In addition to this, the digital device sports separate buttons for volume control and program selection. This enables you to switch between programs seamlessly as well as adjust the volume in at any moment’s notice. The program selection button is also used to turn the device on or off. Another pleasing feature of this hearing amplifier is its rechargeable batteries. Yes, it has a charging port beneath it and comes with a USB cable with which you can charge it. The power button turns red when it is charging and green when the battery is full. You must charge the battery to 100% before first use though and you have to always turn it off before assembling it. It also produces full digital tone quality for low audio distortion and clearer voice. There’s a noise reduction feature which helps improve clarity to the maximum. It comes with two process choices- one for noisy conditions and the other for a quiet environment, just like the others. All in all, it is a quality device which is easy to set up and use. It has a small size. You can wear it and have people not notice you’re using a hearing amplifier. It has an effective design. You can switch between programs with ease and adjust volume levels on the go. In most cases, you’ll need lots of adjustments to get it fit onto the ear perfectly. It doesn’t work for everybody. The background noise could be very pronounced and you may not get used to it. Next on the log is this innovative hearing amplifier made by NewEar. The device is designed by audiologists with the latest digital technology. It’s made to amplify majorly human sounds and eliminate background noises. It sports a similar design with the others but the aesthetics is slightly different. There are no buttons you can click on this device. Instead, there’s a little switch to turn it on and off and a small knob to control the volume. You just slide over it with your thumb to increase or reduce the volume to your own preference. These make for an easier and seamless control of the device. One noticeable distinction is that this hearing amplifier comes in pairs, accompanied by a USB charging dock. So when you’re done for the day you just put the device in the charging dock so the batteries could be charged for use for the next day. In addition to this, the hearing amplifier is light and has invisible bendable ear line tubes. So it’ll be unnoticeable when you wear it. It fits perfectly behind the ears and feels comfortable even if you wear spectacles over it. It is a perfect solution for your hearing problems if you don’t want to spend a considerable amount of money on a hearing amplifier. It comes in twos. If you have hearing loss in one ear, you can use one and keep the other in case you lose the former. It may not last long. It suffers a range of problems after a while. Could go on and off unexpectedly. The Britzgo BHA-220 Hearing Amplifier sports a modern stylish design such that it fits in perfectly with the shape of your ear. It is touted to offer benefits of hearing amplifiers worth 30 times its price. It is very affordable. It is majorly for people who only need a little hearing boost and aren’t ready to splash huge bucks on a hearing amplifier. 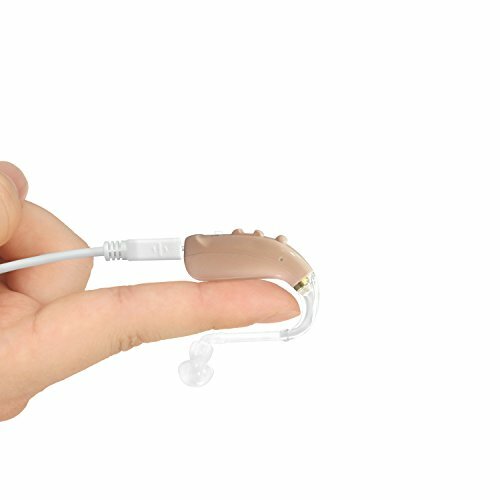 The Britzgo hearing amplifier is approved by doctors, audiologist and the FDA though. The small discrete device has a button to adjust volume levels, and other buttons to turn the power on and off and to change its program. It’s also lightweight and comfortable, and you can wear it all day long without feeling it in your ear. Apart from these, it boasts of an active digital noise reduction ability, you can wear it immediately you take it out of the box without having to test it, and it has an inbuilt super-efficient power consumption ability. It is touted to have a battery that lasts for more than 500 hours. This means you can use it for 20 full days without having to charge it. It comes with 4 pre-set modes which are accessed by pushing the “M” button on the unit repeatedly. Program 1 enables you to hear sounds of wide frequency (1-6 KHz); program 2 is for low frequency sounds (0.3 – 2 KHz); program 3 is for high frequency (0.8 – 4 KHz) sounds while program 4 is the setting for medium frequency (0.5 KHz – 3 KHz) noises. Hearing amplifiers are much cheaper than hearing aids. Hearing amplifiers are easily available than hearing aids, which can only be sold when a prescription from a doctor is tendered. Frequent use of hearing aids damages the ear. They’re only suitable for people who have lost almost all hearing. There’s no such risk with hearing amplifiers on the other hand. So, buying a hearing amplifier is not something to be rushed. There are some factors to consider and questions to answer before you decide to buy one. Ease of use. How easy will it be for you to use this particular hearing amplifier? Do you take design and ergonomics serious? Is the design what you want? Can you easily adjust the amplifier volume and programs? What is your budget? The key thing here is to buy the best you can afford. Is it programmable? Does it have features you seek in a hearing amplifier? Is it suitable for the situations in which you plan to use it? Are you okay with the battery life? Will you prefer the battery to be rechargeable or not? Once you’re able to give satisfying answers to these questions, you’re good to go.